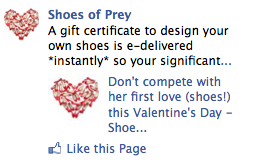 Last year we tried running a Facebook ad for Shoes of Prey gift certificates for valentine's day. Sadly it didn't work. We're trying again, this time with a 'Page Post Advert'. Jodie wrote a Valentine's day blog post pitched to men for the Shoes of Prey blog, which we posted to our Facebook page and that forms the basis of the page post advert. This ad type is more social than the one we used last year. The ad shows how many likes, comments and shares the Facebook post has which gives it some social currency. This ad type shows two images, one from the blog post and our Facebook page icon. As you can hopefully see, Susie created a heart out of red shoes which we've used for both images, we're hoping the image draws the attention of guys who haven't yet bought a present for their significant other for valentine's day. We're targeting the ad to men in relationships who have friends already connected to Shoes of Prey. Ideally we'd be able to target the partners of Shoes of Prey fans, but Facebook's targeting doesn't get quite that granular. The ad isn't perfect but I think it's much better than our efforts last year. We'll let you know how this one goes! I'm testing this ad format starting tomorrow too. I love how much sidebar real estate you get, especially when targeting fans or friends of fans. First - Try headlines using "Wife Valentines Gift" or similar and create specific ads based on their relationship status (you'll have to use a different ad format though). Second - Test an ad targeting women, encouraging them to "hint" to their partners. Sure it's not romantic, but men buying gifts is an incredibly unresponsive audience and you might struggle to get volume. I love the concept - hope you improve on last year's results. The blog is a little confusing - the headline seems to be targeted to men "Don't compete with her..." and the body seems to be targeted to women "...suggest that your significant other...". (If the people you're sending to that page are men who haven't heard of SoP before then I'd suggest there was more info above the fold). Also - if your ad is targeting men, then it's widely been shown that a picture of a woman will give you a much bigger CTR than almost anything else! Thanks for the suggestions everyone. The ad is performing horribly, a 0.008% CTR and has had 12 clicks despite a $0.50 bid! I don't think any changes are going to solve this one, except perhaps a photo of an attractive female which we might try next year. Guys just aren't thinking valentine's day on Facebook!